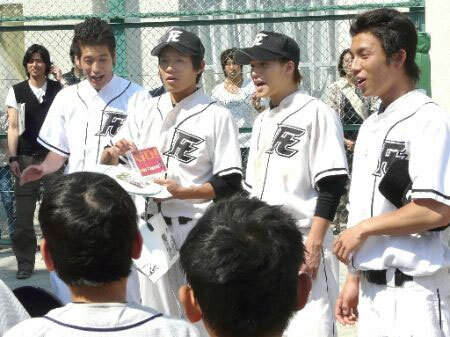 High school baseball movie “Rookies – Sotsugyo” looks likely to be the hot movie ticket of the summer. Distributor Toei said yesterday that advance tickets sales have reached 180,000 since March 8, surpassing those at the same point for last year’s “Hana Yori Dango – Final.” That movie went on to make &yen7.7 billion and became the biggest Japanese box-office success of 2008. The two movies seem to have been born from the same formula: they are both adaptations of TV series that ran on the TBS network, and bring to a climax the story that played out on TV; they both made the leap to the big screen because of high audience ratings; and they both feature a cast of handsome young actors. Mind you, though the story revolves around a high school baseball team aiming for the national championships, all the actors are in their 20s. Yesterday, they took on a real team of elementary schoolers in Futagotamagawa, the Tokyo suburb where their fictional school is located, and beat them 6-2. They then led a parade through the local shopping district, where 1,000 fans turned out to cheer them on. The movie is scheduled to open on May 30.